Ironman Copenhagen was the second of two Ironman races taking place over the weekend, but as the bigger of the pair it’s the first I’ll examine (Ironman Japan will follow tomorrow). 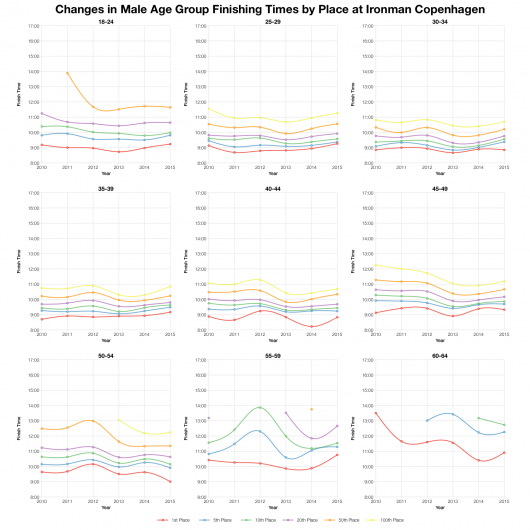 This was the sixth year of racing in Copenhagen although only the third under the Ironman branding; for this analysis I’ve also used results from the earlier Challenge races. 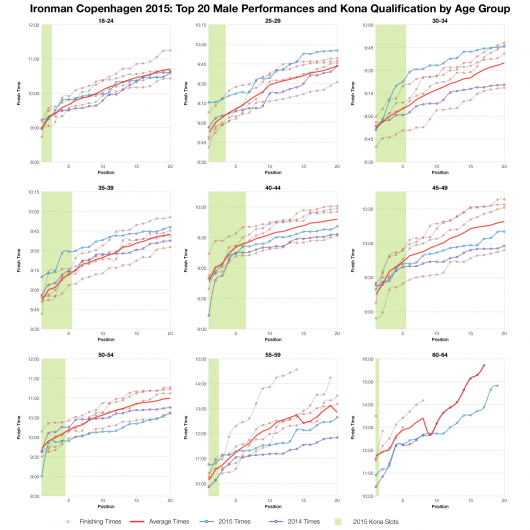 Copenhagen has always been a fast course with strong results, gaining one of the 50 Kona slots available requires a fast time in your age group. This year’s race appears to have been slower than usual, but not by much. 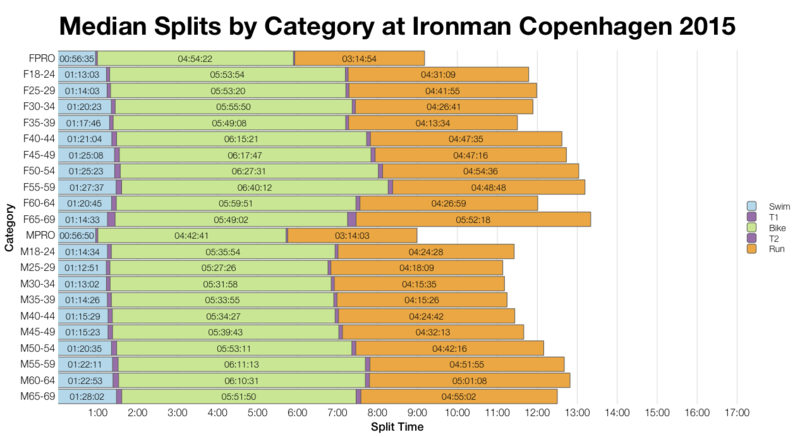 For the most part this year’s median splits come out slower than in the previous years of racing at Copenhagen. 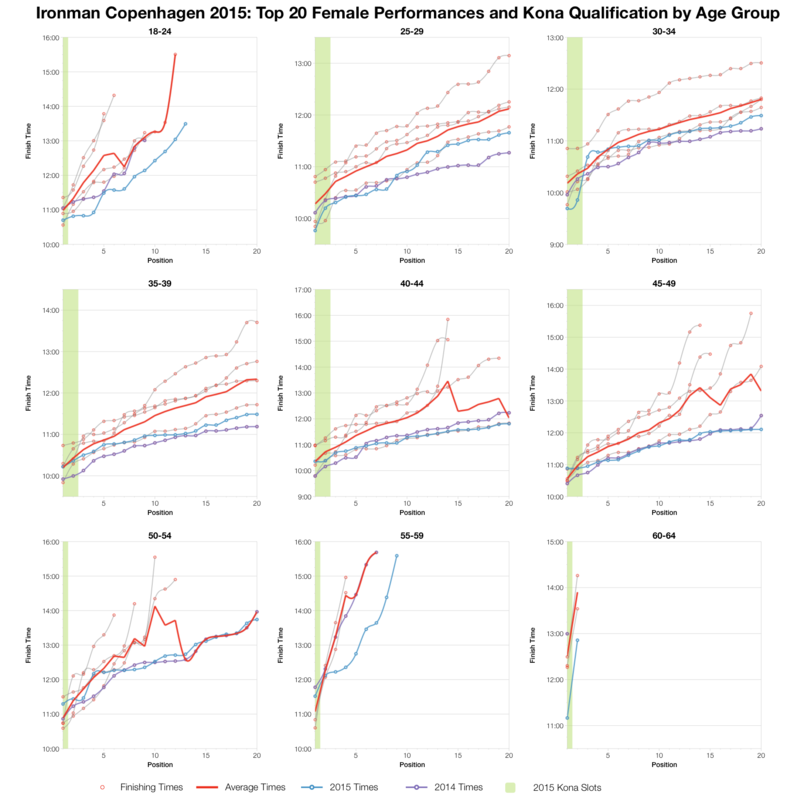 There are exceptions, mostly occurring among the women’s field, for example both the female pros and the 35-39 age group saw big jumps in performance. 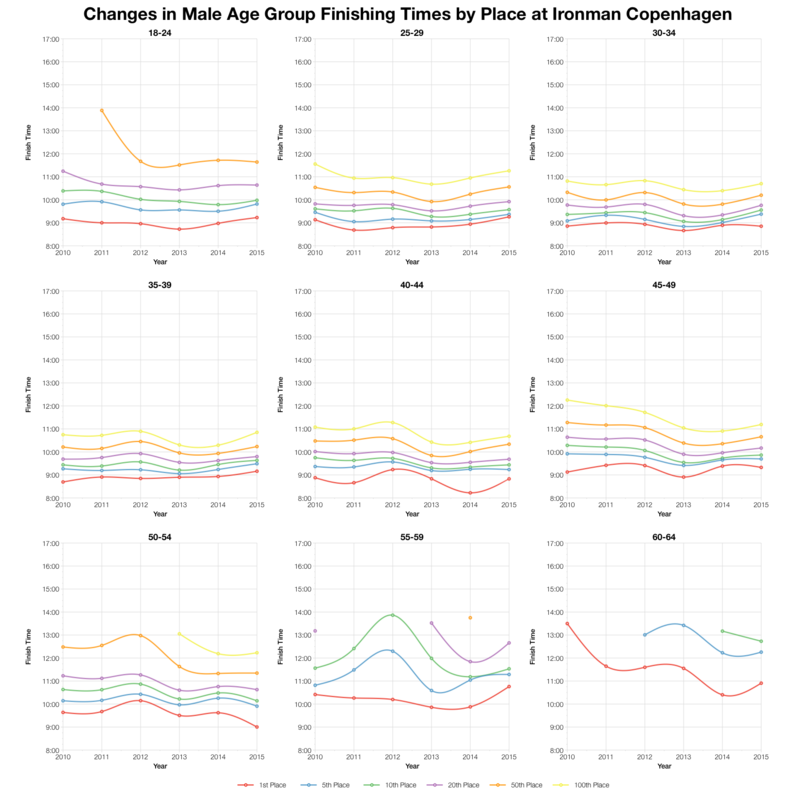 For the most part though the race appears to have been slightly slower than usual; this is certainly the case across the male age groups. The biggest difference comes on the run although the swim also sees a relatively large change. 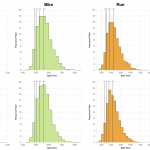 Comparing split distributions shows that every stage of the race trended slower than previous results. 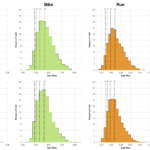 As before the largest changes is on the run where times are most significantly shifted, but swim and bike also display slower distributions. The overall impact appears to be about a 10-20 minute shift in finishing times. 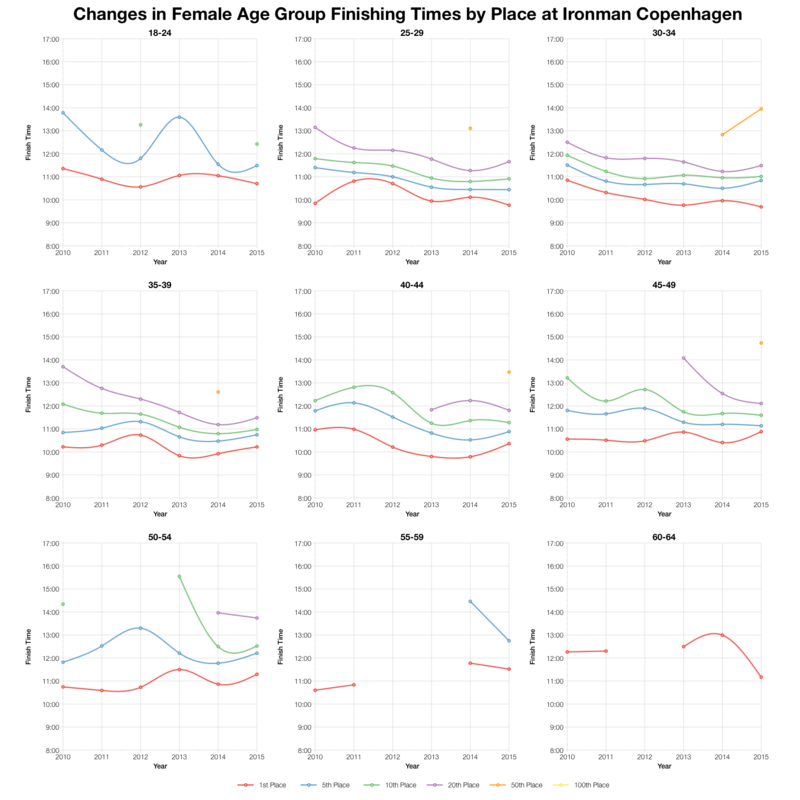 While the distributions might imply quite a slowing of times, looking at how finishing times have trended in the age group field suggests the impact isn’t really that big. In the male field this year’s times do come out towards the slow end of results, but for the women there were actually some very strong results. 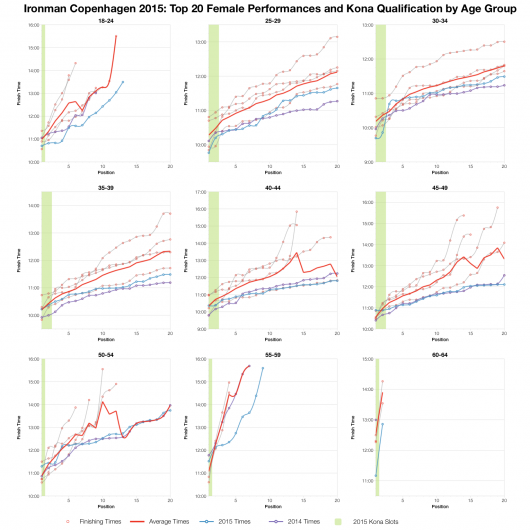 This may reflect changes to the women’s field growing both in breadth and depth since this race began; plus as a late season Kona qualifier the level of competition is potentially high. 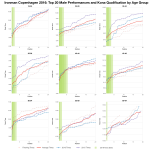 Finally, reviewing the performances in the top twenty of each age group somewhat repeats the gender division. 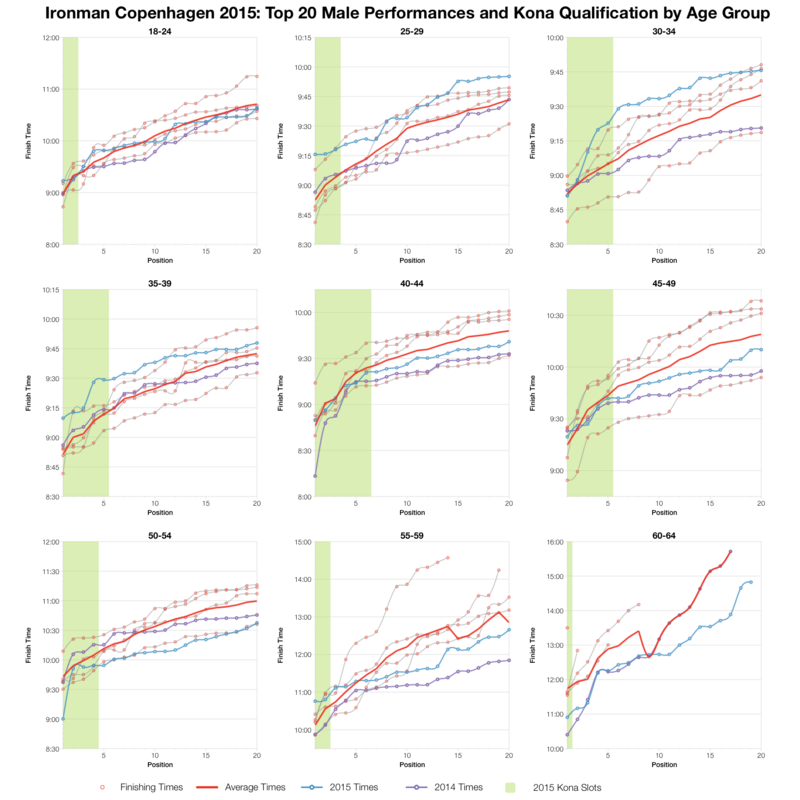 Younger male age groupers tended to perform slower than the race average while their older counterparts tended to perform around or slightly ahead of the average. This would generally suggest slightly slower conditions on the course. 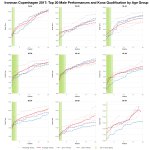 For the women though, most age groups come out ahead of the previous averages although not necessarily by a huge margin. This would point more towards favourable conditions, but I also suspect much of the shift comes from a more competitive field. Until I get some good feedback from the course my take would be that race conditions were a bit tougher than usual and the course was slower for it. That said I don’t think they were hugely different and much of this was offset by the level of competition coming to the race. 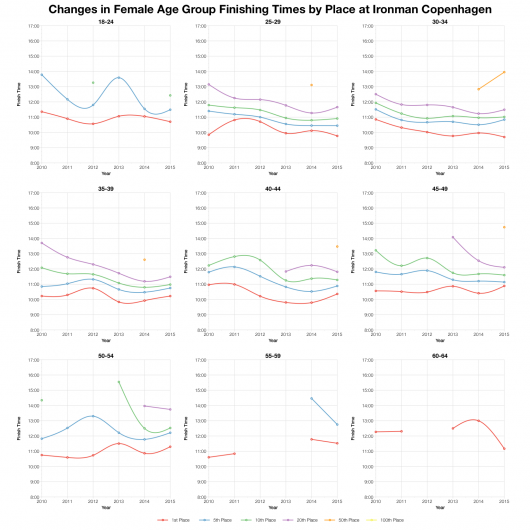 Of note is what seems like a shift in competition among female age groups where performances took a step forward despite the apparently slower conditions. 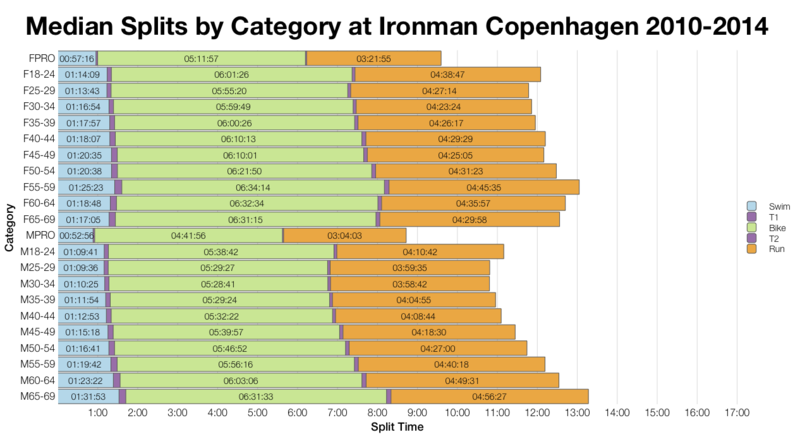 You can access a spreadsheet of the full results and splits from Ironman Copenhagen 2015 on my Google Drive.